ETIHAD Airways and Swiss International Air Lines (Swiss) have launched a new codeshare partnership. Under the agreement, Etihad Airways will have its EY flight code on Swiss services between Geneva and Zurich, two key gateway cities served in Switzerland from Abu Dhabi. Swiss will market its LX code on Etihad Airways’ services between Zurich and Abu Dhabi, offering its passengers codeshare flights to and from the UAE’s capital city. The new agreement is part of the codeshare cooperation which began in 2016 between the Lufthansa Group, of which Swiss is part, and Etihad Aviation Group. AIRPORTS Council International (ACI) World has announced Abu Dhabi International Airport (AUH) as the winner of “Best Airport in the Middle East” for the second year in a row, at its annual Airport Service Quality (ASQ) Awards. The ASQ is the only worldwide programme to survey passengers at the airport on their day of travel. The programme measures passengers’ views of 34 key performance indicators. AUH won the first position in the region, and came in number 57 worldwide. The ASQ Awards ceremony will be held during ACI Customer Excellence Summit in Halifax, Canada between September 10 and 13. CATHAY PACIFIC and Air Astana have announced an agreement that will enhance travel options for Cathay Pacific customers travelling to and from Kazakhstan and for Air Astana customers travelling to and from destinations in Asia and Australia via the airlines’ hubs in Hong Kong and Almaty, respectively. 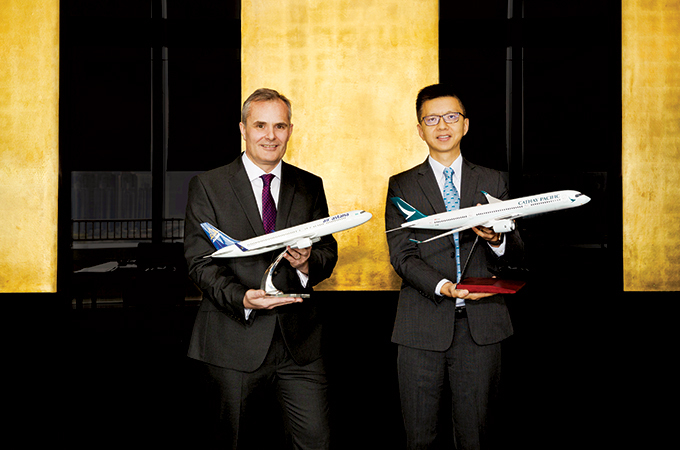 Cathay Pacific will place its “CX” code on Air Astana’s non-stop flights between Hong Kong and Almaty, the financial and cultural heart of Central Asia, as well as on connecting services between Almaty and Astana, the Kazakh capital. Air Astana will place its “KC” code on selected Cathay Pacific services operating between Hong Kong and Sydney, Melbourne, Perth and Singapore. GERMANY’S Munich Airport has been again chosen as the "Europe's Best Airport" in 2018 in the annual World Airport Awards announced by the London-based aviation research institute Skytrax. This marks Munich Airport's 11th first-place finish in this category. The World Airport Awards are based on a global survey of passengers. This year more than 14 million passengers from 100 countries helped Skytrax produce ratings for 550 airports around the world. In the global rankings, Munich took the number one position among airports handling 40–50 million passengers per year, and came sixth among all international airports. QANTAS and Emirates have welcome the Australian Competition and Consumer Commission’s (ACCC) reauthorisation of their partnership until 2023. For customers, the continuation of the joint business, announced in August 2017, will deliver expanded services, greater schedule choice, increased frequent flyer benefits and an ongoing commitment to the development of world class products and travel experiences, said a statement. Qantas International CEO Alison Webster said: “The ACCC’s reauthorisation of our joint business is an important milestone in helping us continue deliver benefits for travellers and Australian tourism for the next five years." Thierry Antinori, Emirates’ executive vice president and chief commercial officer, said: “We look forward to progressing on the plans that will take our successful partnership to its next phase. Together, we offer travellers access to even more destinations on our joint network, more convenient flight choices, and frequent flyer benefits."